As public school systems slash budgets and eliminate musical education programs around the country, more and more parents are forced to find private musical instruction for their children. For parents who aren’t sure if the benefits of musical lessons justify the added expense and hassle, here are seven of the scientifically-proven benefits of music education. Enhanced Abstract Reasoning Skills – Abstract reasoning skills, which play a crucial role in the development of mathematical and scientific aptitude, are markedly enhanced by musical instruction, according to a 1997 study stating that early childhood musi c education has a positive physiological impact. 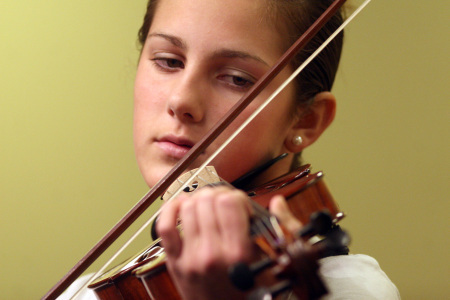 Children who actively participate in band or orchestra, or who have pursued private musical instruction, also tend to have higher math and science scores in adolescent and teenage years. Stronger Cognitive Processes – A Henrich Heine University study reported findings that exposure to music enhances the cognitive process, boosting language and reasoning abilities. After studying the undergraduate majors of medical school students, noted physician and biologist Lewis Thomas also discovered that 66% of music majors who applied to medical school went on to be accepted, the highest percentage of any group. Higher Standardized Testing Scores – On average, students with musical instruction and performance experience scored up to 57 points higher on verbal portions of the SAT and 41 points higher on the math portion than their peers with no musical background, according to the College-Bound Seniors National Report: Profile of SAT Program Test Takers. Princeton, NJ: The College Entrance Examination Board, 2001. Increased Likelihood of Finishing High School and Attending College – Several studies, including one conducted in Florida in 1990, indicated that music, art and drama programs in public schools helped children to feel more involved with their school, and fostered a sense of community with like-minded fellow students that positively influenced their decision to stay in school. Similarly, a 2007 Harris Interactive poll suggests that 88% of those holding graduate degrees have a background in music education. Reduced Likelihood of Drug and Alcohol Abuse – The 1998 Texas Commission on Drug and Alcohol Abuse Report revealed that secondary students who were actively involved with band or orchestra reported the lowest current and lifetime rates of drugs, alcohol and tobacco use. The National Institute on Drug Abuse has also issued a list of factors they believe could reduce the risk of adolescent and teen substance abuse; among them was success in school and involvement with school organizations. Children who are active participants in band, orchestra and other musical activities may face a significantly lower risk of addiction. Greater Self-Discipline – A paper entitled “Music Linked to Reduced Criminality”, which was released by MuSICA Research Notes in 2000, examined a group of Rhode Island natives from infancy to age 30. The study discovered a significantly diminished arrest rate among those who had been involved in music and musical education. The dedication, determination and willingness to sacrifice free time for practice and performance fosters a strong sense of self-discipline in a child, which may lead to a lower likelihood of anti-social behavior. Increased Confidence and Self-Esteem – Developing and mastering new skills dramatically boosts kids’ confidence and self-esteem. Through musical instruction, children are constantly learning new skills, improving them, and sharpening them to excellence. Whether your child is enrolled in private music instruction, or is fortunate enough to attend a school that still offers a music program, the benefits of a music education are undeniable. If you child's school does not offer a music program, or, if you feel the program is not giving your child everything you are looking for, contact Creative Soul today to schedule a free consultation.